Celebration Planning…UPDATE (15 June)! Saintess Larnia to celebrate JudiLynn India’s art at Ce Soir Arts! – Ce Soir Arts – Be inspired tonight! Celebration Planning…UPDATE (15 June)! Saintess Larnia to celebrate JudiLynn India’s art at Ce Soir Arts! JudiLynn India‘s exhibits at both The Gallery and The Conservatory at Ce Soir Arts are going beautifully, and many visitors have come to spend time with her work. We always enjoy this part of exhibits, and have truly delighted in some conversations that have been sparked with patrons. Generally, we let visitors wander on their own and only greet them if we happen to be nearby – but we are always happy to hear from anyone who might drop by, especially if they have found something special to enjoy. That is certainly the case this June, as JudiLynn‘s remarkable art draws an appreciative crowd. One with whom I enjoyed a rather lengthy conversation had many compliments to offer; I was saddened to note that he did not, however, leave a note for the artist in the Gallery Guest Book. This is not uncommon, as people come and go without jotting a note…which is, of course, their prerogative. I do so enjoy the notes that are left, and I miss them when I know that someone whose interest has been piqued steps away without a written commentary…. Despite the general paucity of written comments, it is clear that people do enjoy art at Ce Soir Arts – and JudiLynn‘s exhibits are no exception to that. In fact, several visitors have told either Aeon or myself that they are returning each month to see new exhibits routinely. That they are enjoying JudiLynn‘s work immensely is quite gratifying to us all. People gather where beauty is to be found, and we know that we’ll be having an influx of visitors come 23rd June! We are planning a celebration of JudiLynn‘s art for that day at 1 PM – with the lovely and talented SAINTESS LARNIA stepping to the stage to delight us, one and all. Those of you who know Saintess are likely much like the rest of us – enamored of her sweet style and spicy mix of tunes, both original and otherwise. This talented woman, whose acoustic guitar base provides a steady ground for her spot-on vocals, knows music – and her love for it shines through every note. You can hear the emotion in her voice as it wraps itself around you in the environment. Charming and entertaining, Saintess always leaves us happy – and wanting more! Come join us! Check our last post for a bit more about JudiLynn and this exciting exhibit that expresses so much about her innate talent with colour, form, and composition – as well as that certain je ne sais quoi that makes her work so compelling. Check back also for details about the celebration! We’re excited and hope to see you here! 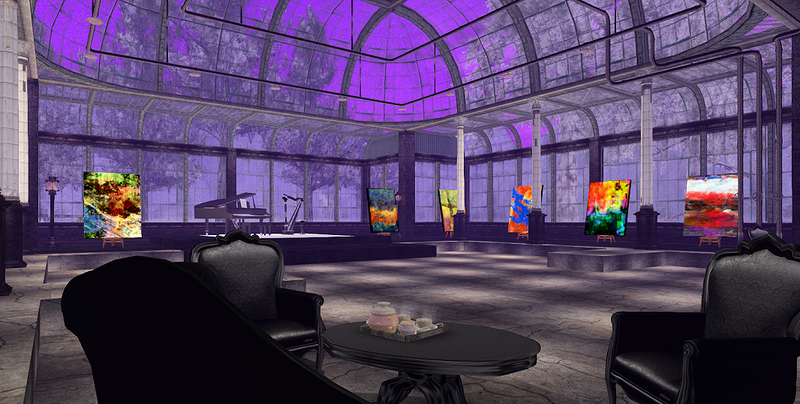 For now: JudiLynn‘s Exhibit at The Gallery at Ce Soir Arts and at The Conservatory at Ce Soir Arts. Don’t forget, you are welcome to purchase any of the pieces and to leave a tip for her as well to support her wonderful work. Stay as long as you like to explore this art and all of Ce Soir Arts. Dance, relax, enjoy! Next Another Lovely Hour with The Poet Laureate at Ce Soir Arts, Russell Eponym! See you at NOON SLT!